An Employee Performance Review is generally done on a particular project or for a fixed duration of time. The name and designation of the employee as well as the reviewers. The employee Performance Review Templates should be reviewed in various categories including his attitude, work ethics,etc. and should be judged on parameters from excellent to poor. A comment for each choice should be stated by the reviewer. 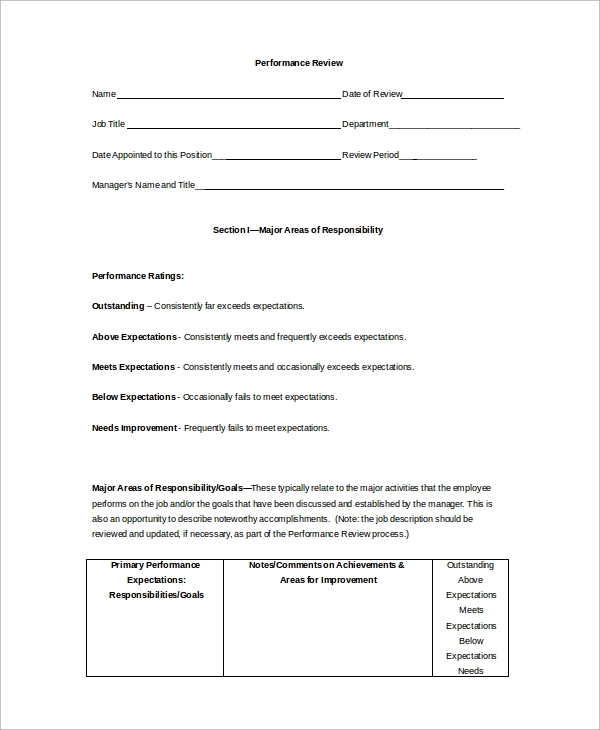 You can get highly customizable Employee Performance Review Templates right here and add any parameters as per your requirements. 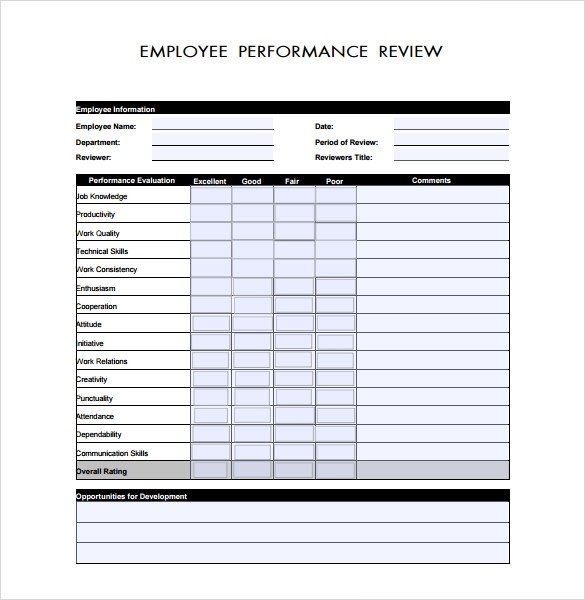 All the Employee Review Templates are available in easy to download MS Word doc and Adobe Acrobat pdf format. 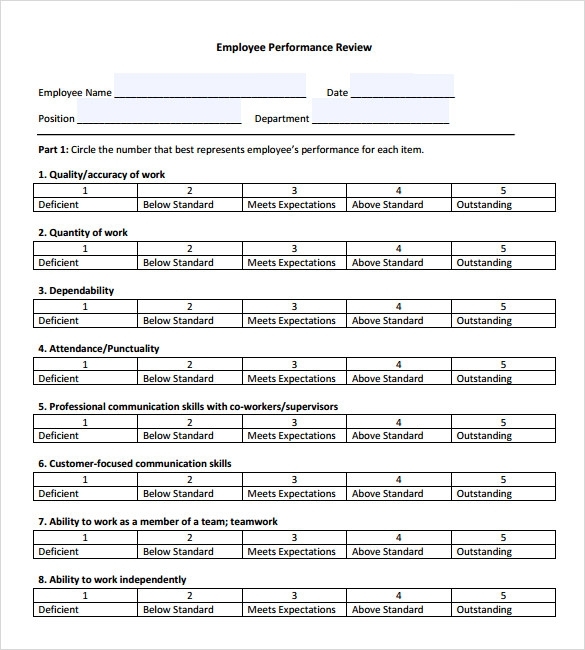 If you don’t want your employee performance review form to look clumsy and over-the-top, you must get this Simple Employee Performance Review Template. The USP of this template is that the content present in it as well as the overall design is out-and-out simple. Every non-profit organization relies on it employees for its success. And that is why getting the performance of your employees reviewed from time to time with the help of a good employee performance review form made using an effective Non-Profit Employee Performance Review Template is important. Employees are the backbone of a corporate house. Their performance directly influences its success as a business. Therefore, business owners use effective employee review forms made from good Corporate Employee Review Templates for desired results. HR executives perform one of the most important jobs for a company. Hence, the evaluation of their performance is desirable. 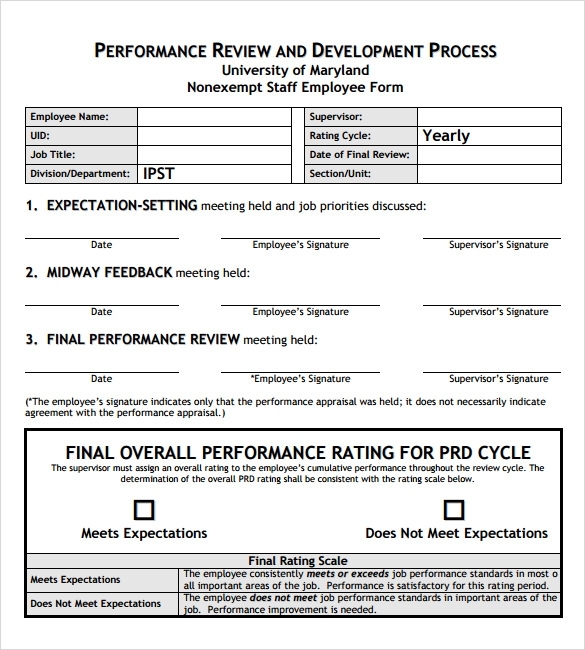 Using a good form developed from an effective HR Review Template to carry out the evaluation is important. Such templates are not only user-friendly but also extremely well designed. How do Companies Evaluate the Performance of an Employee? While there are many ways to do so, most organizations prefer to carry out a person by person appraisal. This appraisal is called employee performance review and is of utmost importance for the smooth functioning of the organization. For best results, giving individual feedback is important. 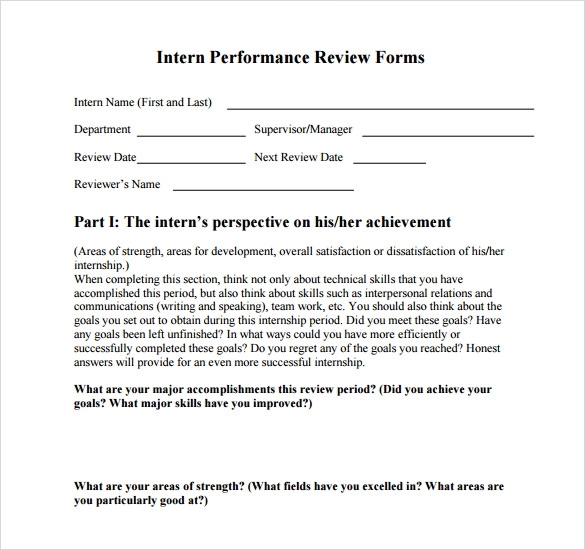 You may like Performance Review Templates. An organization cannot thrive without a strong workforce with unbeatable working capacity. The talent of an employee influences the organization in myriad ways. And that is why it becomes important for the organization to evaluate the performance of every individual employed with them. You can also see Management Review Templates. 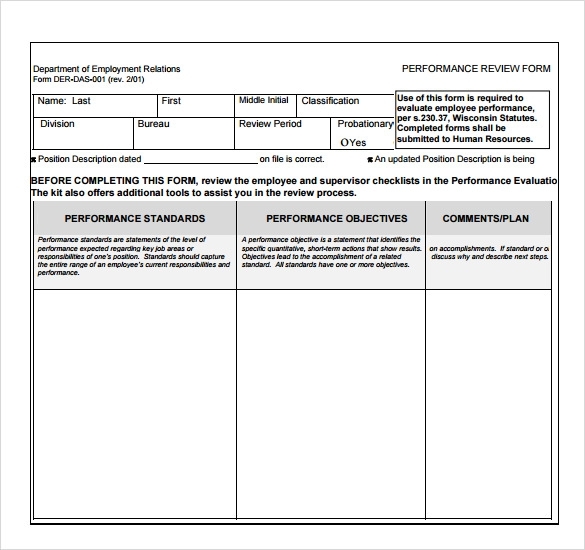 What is the role of Templates in Employee Performance Review? 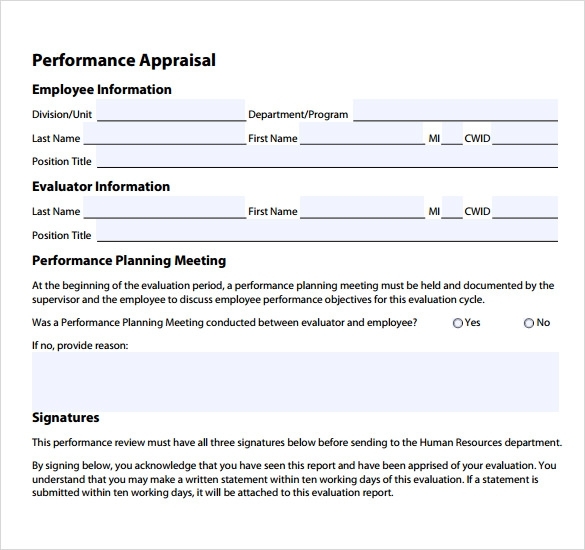 For flawless evaluation, having the right employee performance form in place is necessary. 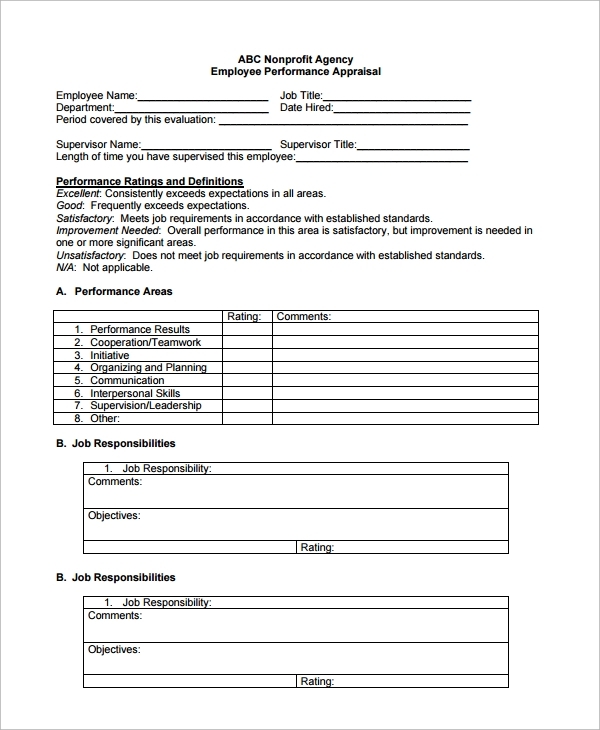 With the appropriate template, you can take the hassle out of employee performance review. Also, you get a readymade format to derive ideas from. You may also like Self Review Templates. Where to get the Templates? You can download the templates from the internet. The best thing is that you can choose from a wide variety of options. There are free as well as paid templates. So, you can select one according to your budget. Also, you can pick any color, size or format as per necessity.